Early in my career, I joined an artists' group, Plexus Art Group, and met a delightful woman, named Roni Mentzer, who taught me how to make a difference by making hats for people who lose their hair from chemotherapy. 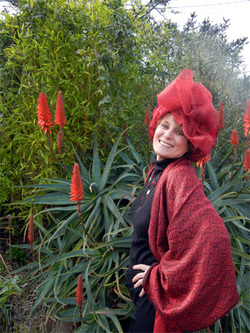 I started from what I love and crocheted her a hat out of bamboo, the most sustainable and comfortable fiber on earth. To build on my love of quilting and creating new fabrics, I made a series of hats using threadlace embroidery techniques with Solvey. As I trekked along my path, I whacked off my own hair and donated it to Locks of Love, an organization that makes wigs for people who lose their hair. I built on my sustainable trashion fashion, with hats created from discarded materials, including Target bags, plastics and audiocassette tapes.